NextReports 8.0 will allow to define a 'Copy' destination type when a report is run / scheduled. 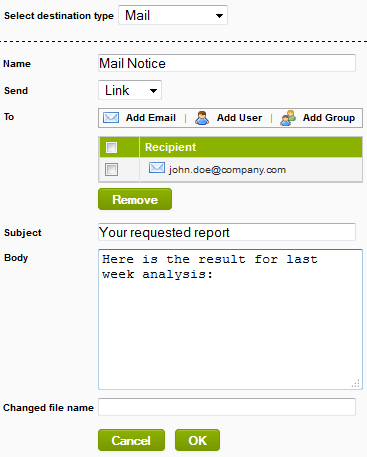 This means a new report with user defined name will be created as a copy of the generated one. Because generated files have an unique name made of report name followed by a random UUID, it may be necessary sometimes to have a known name in order to access the file from an external application. All existing destinations will have a new 'Changed file name' property which is optional. If user specifies another name for the report, then a file copy will be generated as well, that copy will be distributed to the destination and then the copy file will be removed. For 'Mail' destination this property has meaning only if the report is sent as attachment.